I recently attended my third(?) TeachMeet Strathclyde event; the first hosted by CPD Strathclyde – the Next Generation, and the first since the big move from Jordanhill to the John Anderson campus in Glasgow’s city centre. 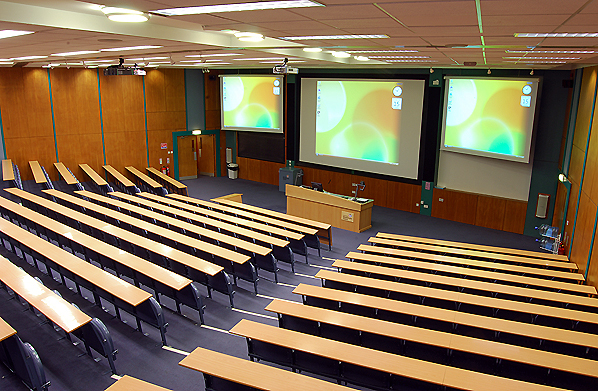 It was a bit of a strange TeachMeet for me, as it was held in K325 in the John Anderson building – a room that I spent much of my Undergraduate time in while I was at Strathclyde studying for my BA; most notably listening to Brian Bett delivering the Basic Psychology lectures. It was certainly a bit strange to be presenting in there, and just to heighten the tension my name was last out of the fruit machine, so I had the whole evening to work myself up into a frenzy. A bit of tech trauma as I tried to get my Prezi up and running added to the anxiety levels, and as I began talking I was very close to having an actual freakout. Added to that, the evening was running a wee bit late, so I felt that I rushed a bit and the presentation suffered as a result. I thought I might be able to fix this with the video, but the 5 minute recording limit on Jing mean that what I’ve ended up with is a real gallop through some of what I said. The screencast didn’t pick up the subtleties of the animation as the Prezi advanced either, so it can look a wee bit jerky, but here it is anyway. Despite my anxiety, the TeachMeet was a great event. I saw some really great presentations, and thought the panel discussion was pretty good too – with some controversial questions and some even braver answers! The new CPD Strathclyde committee did themselves proud, and it was nice to catch up with some of the old guard too, like Morven, Susan and Paul, as well as BEd course leaderAmanda Corrigan who was telling me how proud she is of her students for organising such events (and rightly so!). In the end up, I got quite a nice round of applause, Omar told me my presentation was inspiring and Graham Donaldson gave me a mention in his summing up, so I must have been at least adequate! Have a look below and see what you think.